The BJP is trying to misguide you all for your votes. Usually the members of saffron brigade hate visiting Dalit ghettos in villages but in the election period they are knocking on the door of the Dalits and telling them that they are their brethren. Once the election is over they will again forget you and will cover their faces while visiting Dalit villages. In the context of a political campaign, few would question the analysis that political calculations motivated Mayawati’s assertion that Dalits do not fall within the boundaries of Hinduism. As she accuses the BJP of only pretending to respect Dalits during the campaigning, her emphasis on the differences between Dalits and upper caste Hindus is similarly strategic. In a different discussion of the label Hinduism, the Belief Blog on CNN published “Nine Myths About Hinduism – Debunked” to correct misperceptions of Hinduism in the United States. Drawing in part on the assertions of the leader of the Hindu America Foundation, the article declares, among other things, that caste and gender discrimination are cultural elements, not related to religion and, thus, not a component of Hinduism, and that Hinduism is not polytheistic, asserting that people who identify as Hindus variously define it as monistic, monotheistic, henotheistic, etc. 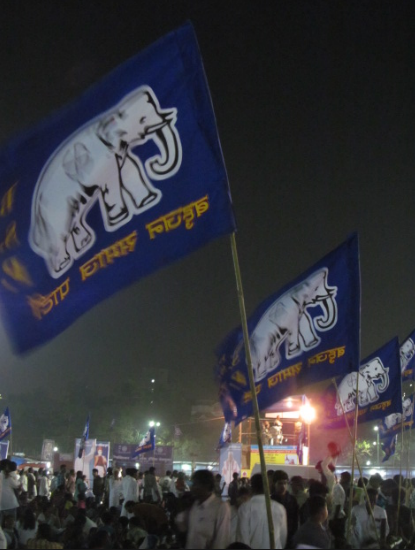 Do we read the CNN article as being as political, as strategic as Mayawati’s assertions? Understanding political to reference various negotiations of interests, including electoral and public policy interests, access to resources, social capital and perception, etc., both accounts illustrate the discussion of elements that we commonly think of as religious as a means to promote particular political interests. Efforts at dialogue to promote better understanding, as the CNN piece is portrayed in its headline, generally valorize particular constructions that some people who identify as Hindu maintain to help a particular audience of outsiders (Americans) have a particular impression of a community. In this sense, what representation is not political? Recognizing the similarity and the strategic nature of representations should lead us to analyze critically representations, whether they come from politicians, practitioners, or scholars. Assuming that some representations are simple, accurate descriptions that people should accept uncritically reproduces the political interests of those making such representations. Scholars for decades have discussed how the definition of religion is strategic, promoting particular interests at particular situations, such as the colonization of various places around the world in the eighteenth and nineteenth centuries. Treating those elements that people commonly identify as religious as something unique, something special that necessitates a different approach, itself serves as a politicized representation.